ONLINE TICKETING IS NOW CLOSED. Tickets may be purchased at the gate until we are sold out. Ticket Reminder: No physical tickets are mailed, simply check in at the gate under the name of the ticket purchaser’s name. Thank you! When the last school bell rings and the school year ends, the fun begins! 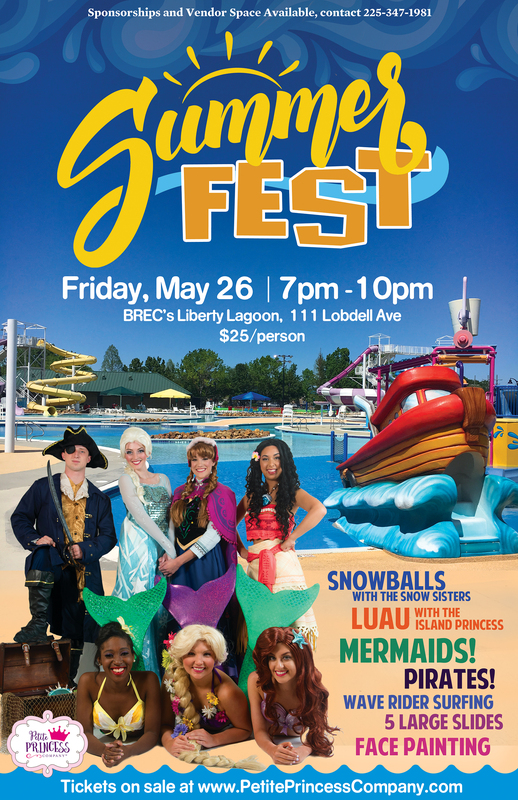 On Friday, May 26 we have rented the entire waterpark at BREC’s Liberty Lagoon (111 Lobdell Ave) for SummerFest and are filling it with princesses, pirates, mermaids and so much more to get your summer started right. Join us for free snowballs with the Snow Sisters, sword fighting with pirates, swimming with our lovely mermaids, a shell dig, face painting, food and fun. Limbo and shake your leis (provided to all children) in our Luau with our new Island Princess. Mermaid princesses include the Frog Princess, the Tower Princess and of course the Little Mermaid. 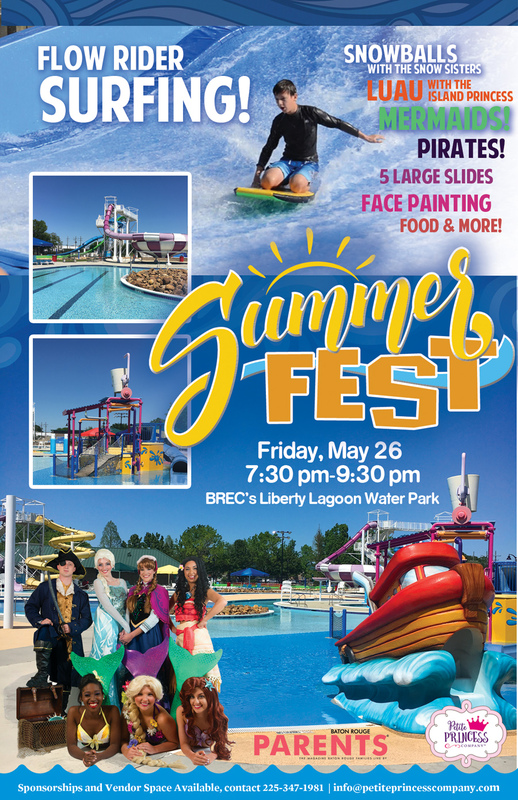 BREC’s amazing Liberty Lagoon features 5 large slides, a lazy river, splash pad, fountains and several large water play areas. Be the first to try the new Flowrider surf station where you can catch a wave without ever getting in the ocean. Facepainting ($10/per) with waterproof makeup will be offered by the amazing Sparkles the clown at Animated Art. Tickets are $25 per person and can be purchased here. Tickets MUST be purchased for any age. Check in at the door under the ticket purchaser’s name. Pre-purchase encouraged as our events usually sell out quick. Any remaining spaces will be on sale at the door, first come, first serve. In case of rainout, event will be held the following Friday, June 2. NO REFUNDS. Life jackets encouraged for small children, there are some available at the facility free of charge. All life vests or jackets must be United States Coast Guard approved. Swim diapers required for any children not potty trained. No alcohol. Personal inflatable floats are not allowed in facility. ALL BREC PARK RULES APPLY. We have Vendor Space and Sponsorships Available! Must be received by the deadline of Friday, May 12 to be considered. We welcome any viable event insurers. If you need a recommendation on an insurer, we recommend for Event Helper. We must receive a copy of your application, insurance (food vendors) and business license (food vendors) by the deadline of Friday, May 12 to be considered. *Food Vendors must also have a million dollar liability policy with BREC and Petite Princess Company listed as co-insurers. A copy of OUR event insurance is available upon request. *Food Vendors must also have a million dollar liability policy with BREC and Petite Princess Company listed as co-insurers. Must also provide copy of business license. Please submit with application. Please contact Venessa Lewis at 225-347-1981 for questions regarding sponsors and vendors.